With over $23.9 million in total prices realized, including $12.7 million in United States coins, the Stack’s Bowers Galleries Official Auction of the Whitman Coin & Collectibles Winter Expo was a successful conclusion to the firm’s 2018 showcase auction season. 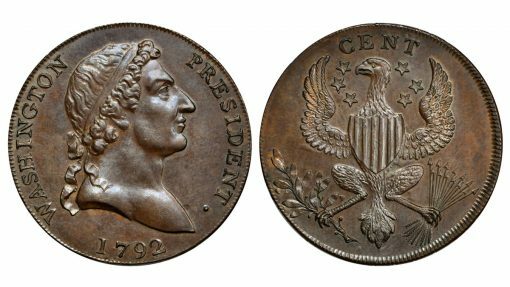 Highlighted by the Archangel Collection of Colonial and 1792 Coinage, the sale featured a parade of exceptional rarities, many of which had been off the market for decades prior to the Baltimore event. All prices listed include the 20% buyer’s fee. Session 1 led off with Numismatic Americana and offered 18th and 19th century rarities from Betts medals to Civil War tokens and more. One of the most remarkable offerings of the session was the set of six original 1789 Washington inaugural buttons in lot 50. Apparently kept together since their purchase and likely affixed to a single coat, they represent a new variety that is unlisted in the Cobb reference on the series. After much bidding the set sold for $28,800. This trio of ca. 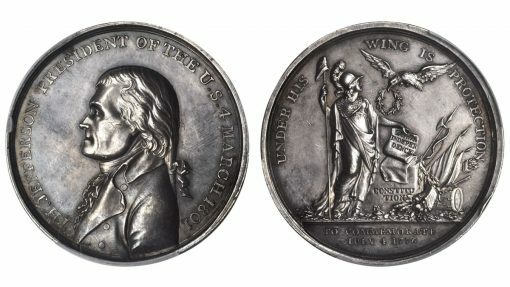 1805 “History of the Revolution” silver medals brought $72,000. The highlight of the session was the trio of ca. 1805 "History of the Revolution" silver medals by Joseph Sansom, pedigreed to the Sansom family. Accompanied by the original silver and teak wood frame, this historic set sold for $72,000. 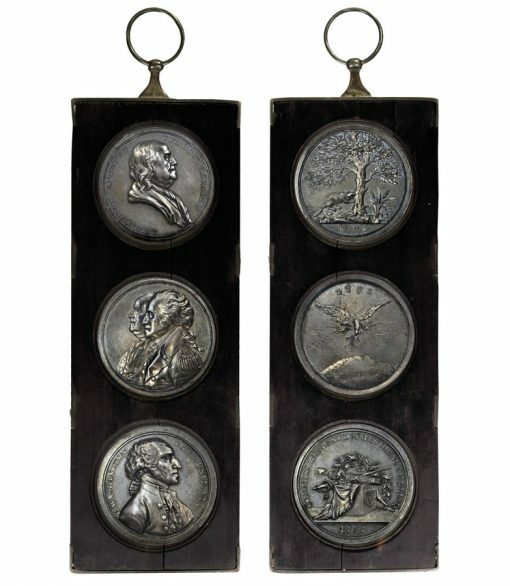 A similarly historic piece in lot 103 commemorated the inauguration of Thomas Jefferson and the 25th anniversary of the Declaration of Independence. Certified SP-61 (PCGS), the silver 1801 Jefferson Inaugural medal earned $36,000. Session 3 contained Rarities Night which featured a diverse and exciting selection beginning with colonial and early American treasures. An extremely rare ca. 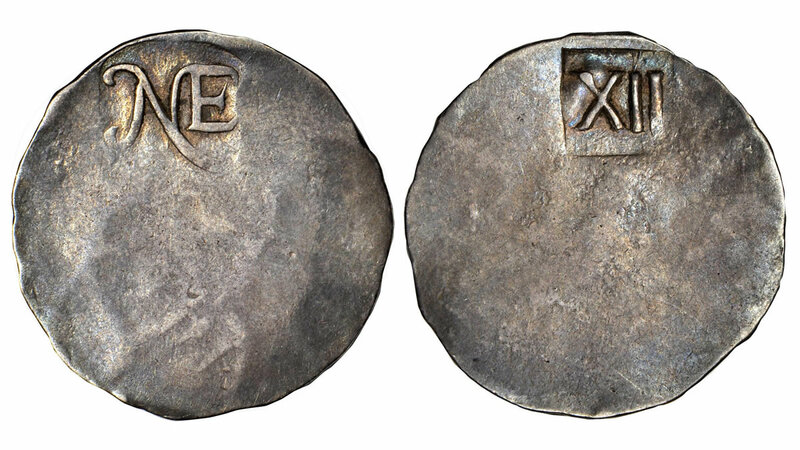 1616 Sommer Islands shilling brought $52,800 in lot 2004, surpassed by the finest known 1783 Chalmers threepence in lot 2008 that sold for $69,000. A beautiful MS-67 RD (PCGS) example of the 1917 Doubled Die Obverse Lincoln cent sold for $84,000 in lot 2032. Lot 2101 featured a MS-62 (PCGS) 1901 VAM-3, Doubled Die Reverse Morgan dollar that ranks among the finest known of the variety. 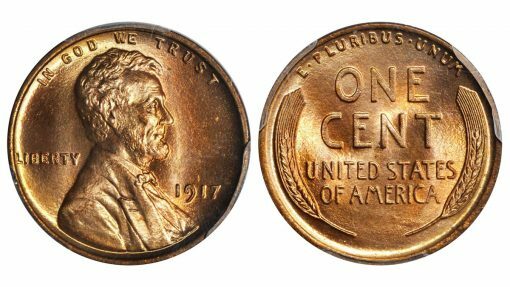 With just one coin certified finer by PCGS it was bid up to $72,000. 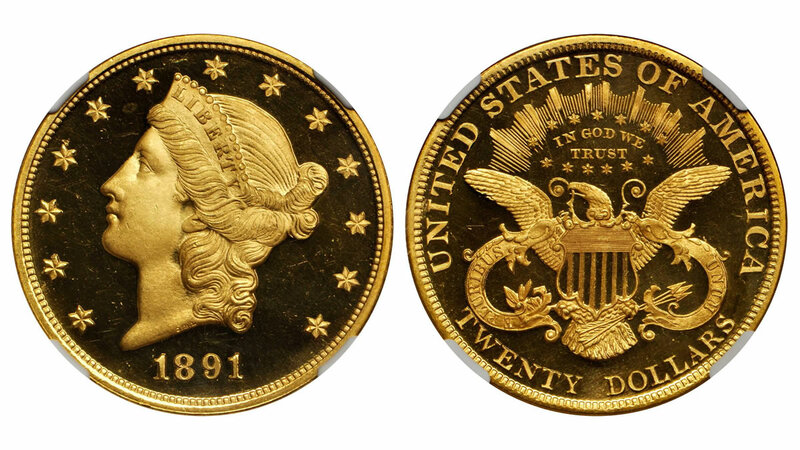 Liberty Head gold coinage has increased in popularity in recent months and this enthusiasm was certainly evident in the Stack’s Bowers Rarities Night session. 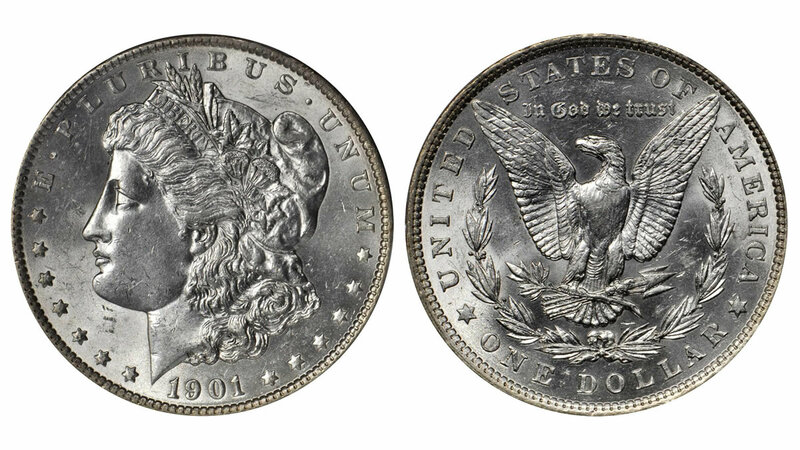 The finest certified 1907-S half eagle was showcased in lot 2149. Certified MS-66+ (PCGS), it was bid up to $96,000. 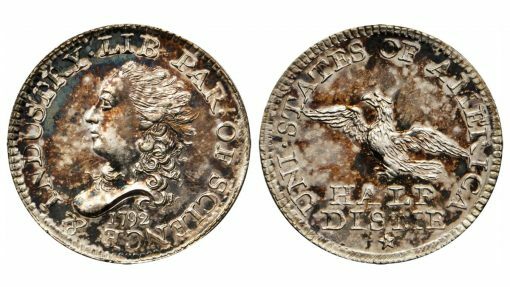 The pinnacle of the session was reached near the end of the night, as the magnificent Proof-66+ * Ultra Cameo (NGC) 1891 Liberty Head double eagle was called up on the auction block. As one of the finest of just 52 examples struck, this piece garnered $192,000, the top price of the session. 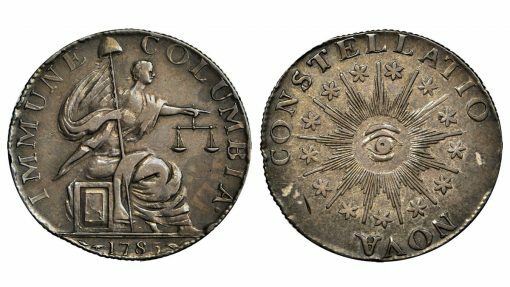 Presented in cooperation with the Colonial Coin Collectors Club (C4), Session 7 began with an interesting presentation of world coins used in early America, all from the Cardinal Collection. This type set was highlighted by a magnificent Peruvian 1762-L JM 8 reales "pillar dollar" in lot 6009. Certified MS-65 (PCGS) and ranking among the finest certified of the type, it earned $26,400. 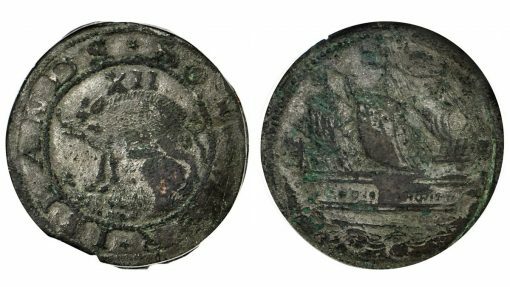 A Choice AU-55 (PCGS) 1652 Large Planchet Pine Tree shilling in lot 6040 sold for $6,600, and a MS-62 BN (PCGS) 1787 Miller 33.1-Z.19 Connecticut copper garnered $4,320 in lot 6153. 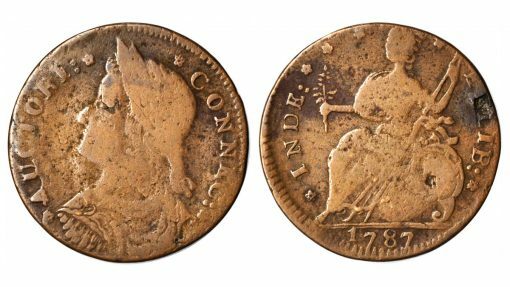 A Rarity-7 1787 Connecticut copper from the Q. David Bowers Collection was bid up to $5,760 in lot 6160, while a Rarity-6+ 1788 Vermont copper from the Cohasco Collection brought $4,800 in lot 6267. Session 8 featured the Archangel Collection and was the highlight of the Baltimore Auction, and perhaps the most anticipated numismatic event of the season. Held privately and off the market for decades, the many treasures in this collection ranked among the finest examples of their types. 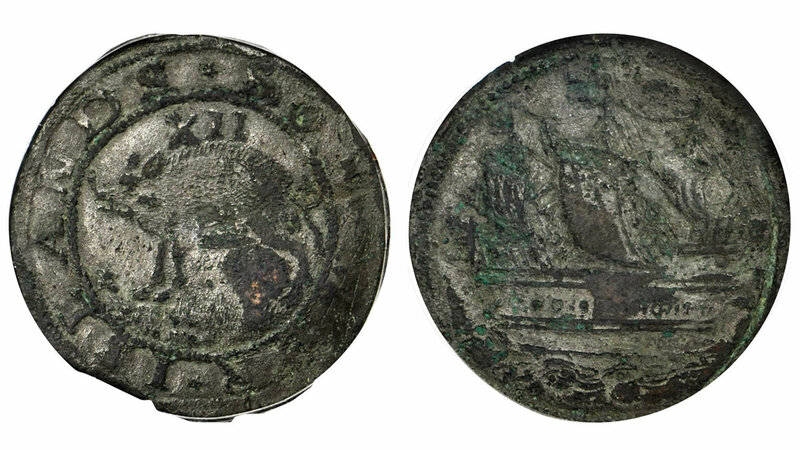 Leading off the session was Lot 7001, an exceptional 1652 NE shilling graded AU-50 (PCGS). Acquired by the Archangel collector in November 1975, it brought $204,000 in the Stack’s Bowers October Baltimore sale. 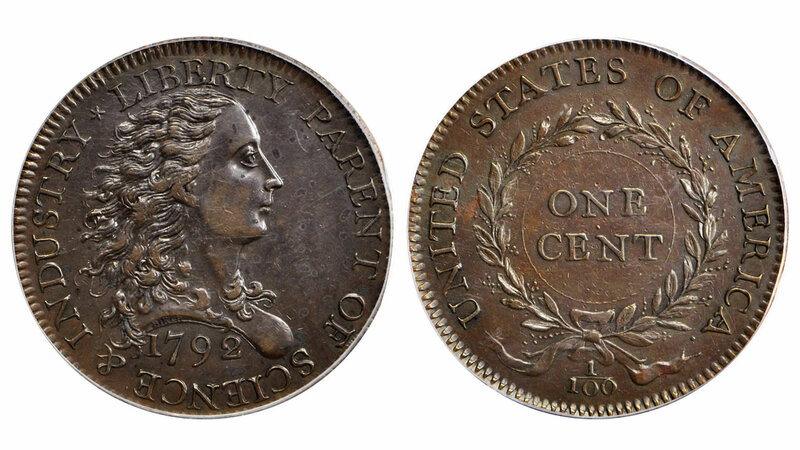 One of five known 1733 Pattern Rosa American twopence sold for $132,000 in lot 7028, while a 1724 Pattern Wood’s Hibernia halfpenny earned $90,000 in lot 7038. Lot 7064 featured a rare silver 1785 Immune Columbia pattern that realized $102,000, while the spectacular MS-62 BN (PCGS) 1787 George Clinton copper in lot 7088 brought $168,000. The finest known 1786 Immunis Columbia / Shield Reverse copper was offered to significant fanfare in lot 7094, and sold for $120,000 once bidding had closed. A magnificent Proof-66 BN (PCGS) 1792 Washington Roman Head cent was presented in lot 7124. Last offered as part of the Roper Collection in December 1983, it brought $114,000 in the Archangel sale. The evening was concluded in remarkable fashion with the presentation of 1792 pattern coinage. 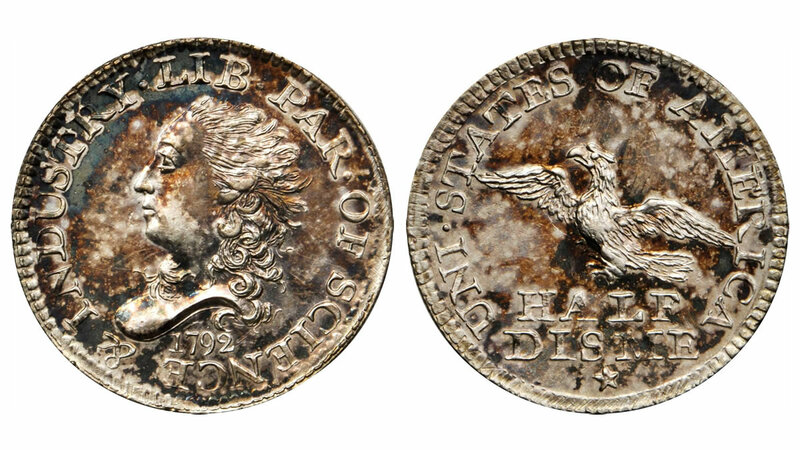 The exceptional MS-63 (PCGS) CAC 1792 half disme in lot 7150 is traceable back to 1942 and realized $240,000. Lot 7151 featured the unique Judd-3 1792 Birch cent with a plain edge, pedigreed back to Ed. Cogan’s sale of December 1859. It was acquired by the Archangel collector from the May 1976 sale of the Laird Park Collection, and collectors at the Archangel sale bid it up to $660,000. Lot 7152 featured a 1792 Silver Center cent once owned by Dr. J. Hewitt Judd and used to illustrate the issue in his pattern reference book. Certified SP-45 (PCGS) CAC and last offered at public auction over 111 years ago, it sold for $336,000 in Baltimore. 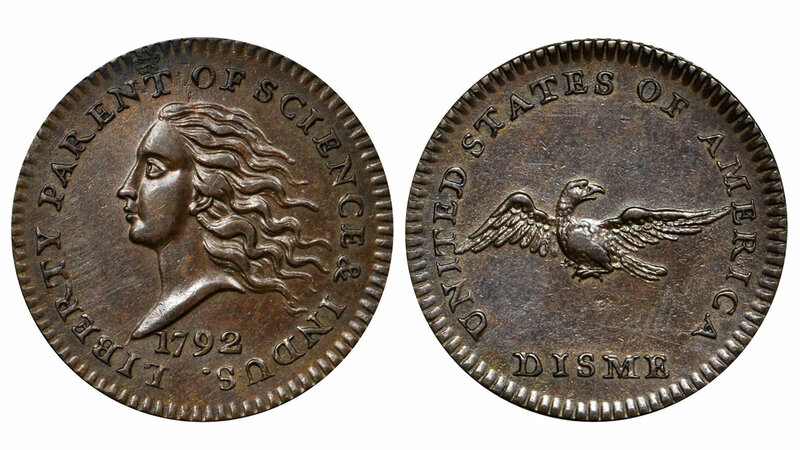 A beautiful AU-58+ (PCGS) CAC 1792 copper disme completed the set, and brought $360,000 in lot 7153. Stack’s Bowers Galleries (StacksBowers.com) is planning for its exciting 2019 auction season, which will commence with their New York International Numismatic Convention sale in January and a return to Baltimore at the end of February for the Official Auction of the Whitman Coin & Collectibles Spring Expo. To consign your collection to a future auction contact a Stack’s Bowers Galleries representative today at 800-458-4646 or info@StacksBowers.com.